It’s far more than sleight of hand, this act of learning alongside our learners. It’s as delightfully magical for the way it occurs at the most unexpected moments as it is for how it rapidly produces small and large shifts in our own training-teaching-learning approach. And the stimulation that accompanies that level of collaboration in the learning process is one of the most consistently rewarding aspects of formal and informal learning opportunities we are likely to encounter, I was reminded again yesterday morning. 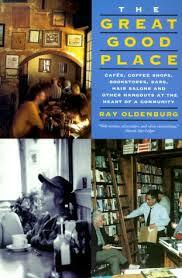 I didn’t even, when the moment of magical learning began, know I was walking into a classroom; I thought I was actually walking into a neighborhood café—the sort of Ray Oldenburgian third place—The Great Good Place—where we meet friends, interact, and walk away the better for having set aside the time for exactly that sort of encounter. But that morning quickly and unexpectedly turned into a far deeper and richer learning experience that a friend and I had expected to produce. It began when I spotted the friend and sat at the restaurant counter to join her for a cup of coffee while she was eating breakfast. Commenting on how nice it had been to see her engaged in journaling as joined her, I inadvertently opened a door to a wonderful conversation about how she wished she had more time to write and how, more importantly, she wished she could find a way to combine her love of writing with work that produced an income. Not wanting to skew the results or lead her in any specific direction other than helping her identify the sort of work that might combine her varied interests, I didn’t tell her that this simple exercise I had leaned in a creative writing class many years before had served me well in helping learners achieve a variety of goals including creating branding/marketing slogans for their personal businesses; crafting mission statements for their organizations; and even finding a name for a volunteer-driven community-based project that was so perfect that participants were still discovering lovely nuances in the name a couple of years after they shaped it. I also didn’t tell her that I used a two-minute time limit for the exercise because experience showed that most people and groups were winding down after 90 seconds and that two minutes was generally all it took to complete the most important element of what we were doing together. I knew magic was about to occur when my friend/learner actually began jotting words down into her notebook even before I had a chance to start the timer on her smartphone. 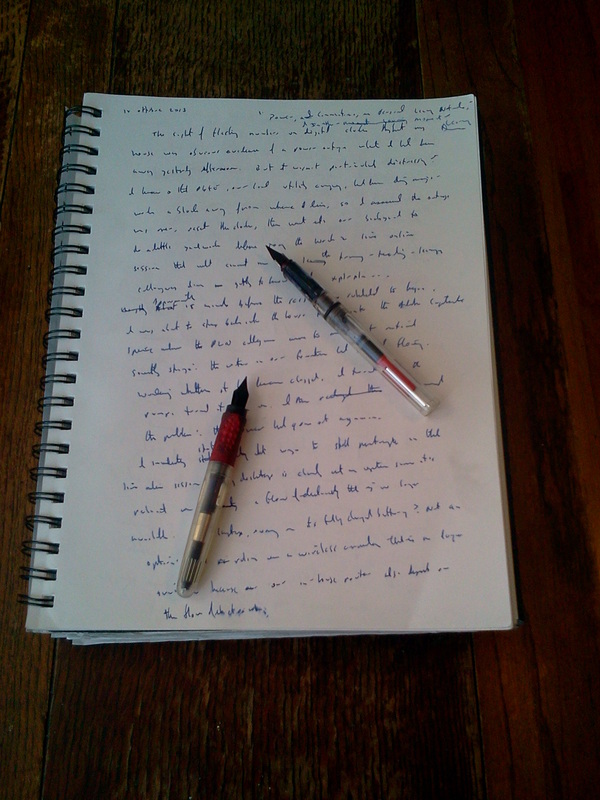 And it continued to take shape when I realized that, after 90 seconds, she not only was still writing as quickly as her hand and pen could place ink onto paper (with no slowdown in sight), but was also writing from left to right and top to bottom on the page rather than doing what every other learner had done before—simply throwing words helter-skelter all over a page or flipchart or whiteboard so the words could be grouped thematically later. As the two-minute mark approached, I recognized I had my own unanticipated moment of leaning to address: stop the exercise as planned or respond to her obvious engagement and complete immersion in what she was doing by ignoring the timer and seeing where additional time would take us. After she finally raised her head five minutes and fifteen seconds into her wonderful stream-of-consciousness flow and asked if her two minutes were up, we both had a good laugh before beginning the process of reviewing what she wrote to see if she could spot meaningful connections between those apparently disjointed words and phrases. And as she read back what she had produced, I felt another moment of leaning magic unfolding: not only had she written down numerous nouns, verbs, and adjectives, but she had actually jotted down words reflecting what she was thinking as she wrote comments along the lines of “oh, this isn’t working” and “oh wait there it is.” Not only had she produced the most richly complex record of a learner’s thoughts I had ever seen in response to this simple exercise, but she had reminded me of something no trainer-teacher-learner can afford to ever forget: set the rules, then break them as soon as they become a hindrance to the learner’s learning process. When we were finished with the review, she told me how helpful the exercise had been in identifying things she knew innately but hadn’t consciously acknowledged, and confirmed that she had learned enough to strike out on her own by returning to the results, running the same sort of exercise using individual words that resonated strongly with her from round one, and creating the sort of pithy summary of what would most appeal to her so she could try to match that statement with work that would reward her far more than what she currently does. And I, in turned, told her that the simple act of running that exercise with her and watching all that she produced had revitalized and freshened a tool I had long enjoyed—and now magically, unexpectedly, and inspirationally, would use with even more enthusiasm for learners who would never know how much that she as learner-teacher had contributed to their learning process—and a wonderfully adaptable tool to help them on their journey. 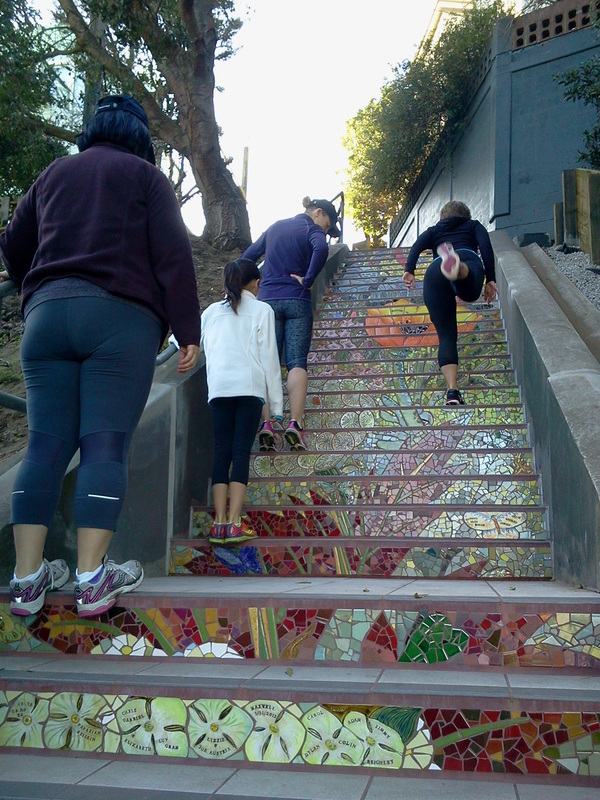 The Hidden Garden Steps ceramic-tile mosaic created and completed by project artists Aileen Barr and Colette Crutcher is in place here in San Francisco, and an ever-expanding community has quickly claimed the site as its own—just as organizing committee members hoped it would. New resources connecting that community are appearing online with increasing frequency. We have seen our existing website, Facebook page, and Twitter account (all created and maintained by project volunteers) augmented through individual initiatives by those who are falling in love with the Hidden Garden Steps (on 16th Avenue, between Kirkham and Lawton streets in San Francisco’s Inner Sunset District): There are already reviews on Yelp, check-ins on Foursquare (including our first official Hidden Garden Steps Foursquare mayor), favorable mentions in the San Francisco Examiner and on Weekend Sherpa, and wonderful articles on Cindy Casey’s “Art and Architecture – San Francisco” blog and Tony Holiday’s San Francisco park trails and public stairways blog. 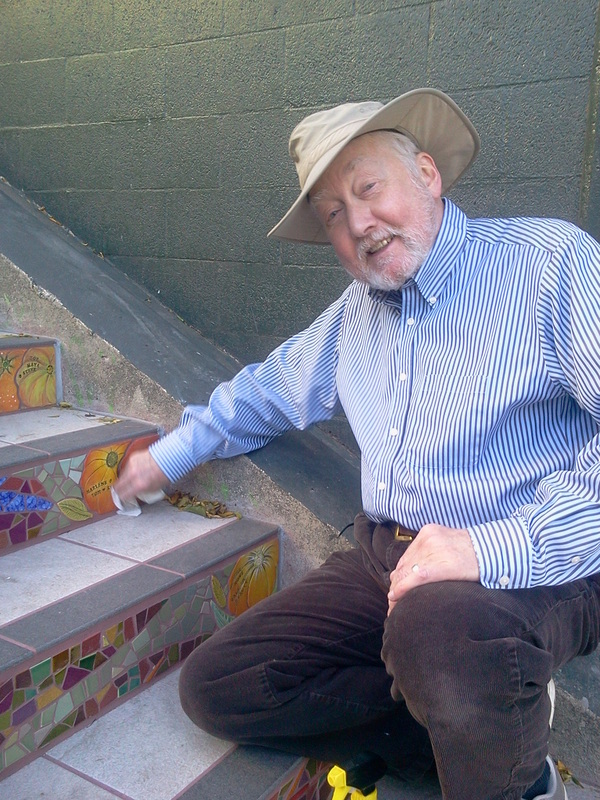 A two-fold agenda was always at the heart of the four-year effort to transform the overgrown, ill-tended, graffiti-marred 148-step concrete staircase (originally constructed in 1926) into a neighborhood gem: creating a second ceramic-tiled staircase with community gardens to complement the original steps on Moraga Street, between 15th and 16th avenues, and creating an outdoor variation on the indoor Third Place concept promoted by Ray Oldenburg in The Great Good Place: Cafés, Coffee Shops, Bookstores, Bars, Hair Salons and Other Hangouts at the Heart of a Community (1989). The formal opening ceremony on Saturday, December 7, 2013 provided plenty of signs that both goals were being met. Sherry Boschert, a Hidden Garden Steps supporter who remains active in a variety of neighborhood initiatives, worked with Steps organizing committee members to organize and orchestrate a community-based volunteer-driven block party that attracted more than 150 participants. Among those speaking at the event were San Francisco County Supervisor Norman Yee (also serving as acting mayor that day); San Francisco Department of Public Works Community Liaison Jerad Weiner, who remains a conduit of onsite support through the San Francisco Department of Public Works Street Parks Program; DPW structural engineer Ray Lui; San Francisco Parks Alliance Executive Director Matt O’Grady, offering support as head of our fiscal agent; and the artists themselves. Every one of those brief from-the-heart presentations acknowledged the number of partnerships, donors, and community volunteers needed to produce something of that magnitude, and Supervisor Yee’s own presentation captured the spirit of the endeavor—rather than placing himself at the center of the event, he very generously spent time acknowledging that he was elected to represent the district as the project was nearing completion and that it was the work of his predecessor (former District 7 County Supervisor Sean Elsbernd) and predecessor’s staff that contributed tremendously to the success of the Steps initiative. Organizing committee members had one intentionally brief, wonderfully playful moment in the limelight as we were surrounded by many of our project partners to cut a multi-colored crepe-paper-weave ribbon stretched across the foot of the Steps. 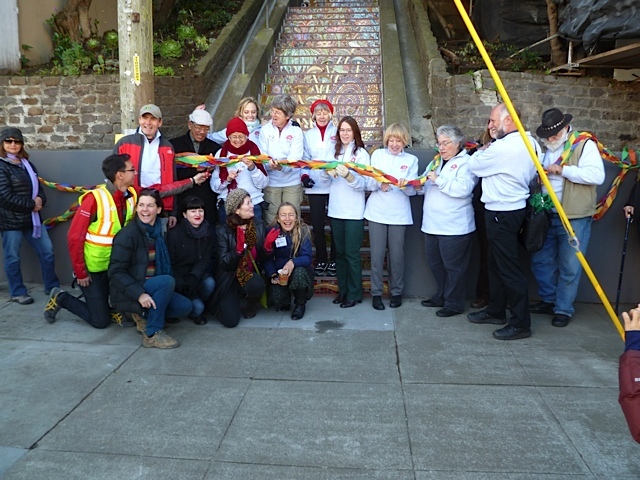 We then literally and figuratively stepped aside as dozens of people streamed up the Steps to transform the site from a project facilitated by a core group of community volunteers to one claimed by the larger community that supports it. By late afternoon, the crowds had dispersed. A sense of tranquility was once again palpable on site. And by mid-evening, the Steps were continuing to quickly evolve into a meeting place for friends as well as for neighbors and complete strangers who otherwise might not be seeing, talking, and dreaming with each other. As I was taking a final look down the Steps just before 10 o’clock that evening, I ended up talking with someone who hadn’t realized the Steps were already completed and open to the public. We chatted about how the project had developed, talked about how he wished he had been available to more actively support and be an active participant in the development and implementation of the project, and talked about other neighborhood projects in development—which made me realize that less than 10 hours after the Steps opened, they were already functioning as an outdoors Third Place that draws people together and creates the possibility of additional collaborations. Those encounters have continued on a daily basis since that initial day. Several organizing committee members and other neighbors all found ourselves engaged in a wonderful impromptu conversation on the Steps on New Year’s Day. Visitors from San Francisco’s East and South Bay areas have repeatedly come to the Steps and brought friends. Those who supported the project through the purchase of individual tiles interwoven into the completed mosaic with personal inscriptions come, photograph, and bring friends to enjoy the beauty of the site and the spectacular views it provides. Project volunteers continue to participate in the monthly two-hour clean-up and gardening sessions held on the second Saturday of each month from 1 – 3 pm (open to any interested new or returning volunteer), and neighbors, without any formal guidance or call to action, simply show up when they see that the Steps need to be swept or in some other way spruced up a bit to keep the site pristine. 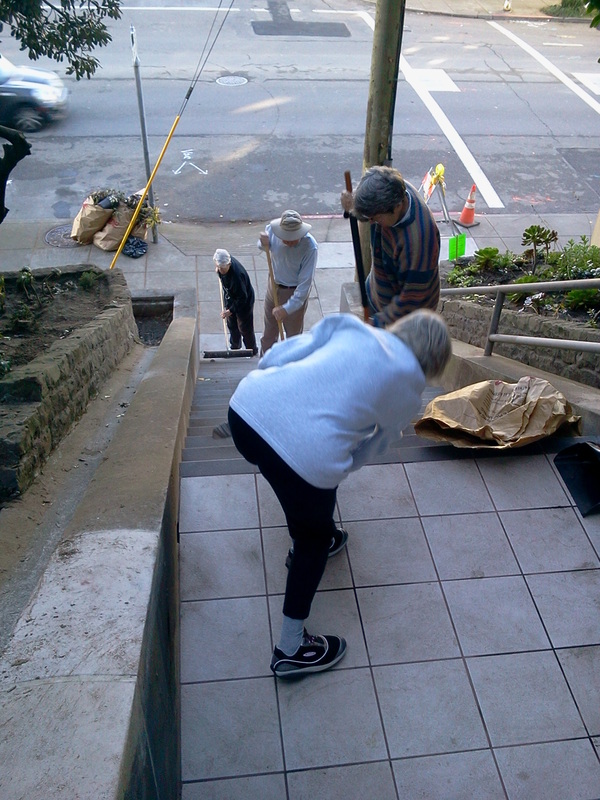 Most importantly of all, the spirit of community and collaboration that drove the Hidden Garden Steps to completion is already inspiring a neighbor—Al Magary—to see if he can informally organize a group to sweep and take other actions to clean up the long-ignored even larger set of steps one block away (on 15th Avenue, between Kirkham and Lawton streets). Anyone interested in joining that budding community of interest can contact Al for more information at 15thAveStepsPark@gmail.com. Who knows? Perhaps a third set of ceramic-tiled steps is on its way. N.B. : This is the twenty-third in an ongoing series of articles to document the Hidden Garden Steps project in San Francisco. There was no need this week to read yet another book or article on how to effectively create and nurture great communities. Participating in live online sessions with colleagues in two wonderful communities of learning (#etmooc, using the #etmchat hashtag and a Google+ community for online exchanges, and #lrnchat) provided experiential learning opportunities among those trainer-teacher-learners: participating in discussions to explore what makes our communities attractive or unattractive, and contributing to the conversations in ways that produced immediate results, e.g., a name for a new learning community that is in the early stages of formation in Australia. The first of the two communities—#etmooc—is relatively young, having grown out of the Educational Technology & Media massive open online course (MOOC) developed by Alec Couros and colleagues earlier this year, while #lrnchat appears to have been in existence at least since early 2009 and is currently facilitated by David Kelly, Clark Quinn, Cammy Bean, and Jane Bozarth. While #etmooc draws together a worldwide group of trainer-teacher-learners interested in improving their ability to effectively and engagingly incorporate technology into the learning process, #lrnchat has the somewhat broader goal of serving as a community “for people interested in the topic of learning [and] who use the social messaging service Twitter to learn from one another and discuss how to help other people learn”; those first-rate #lrnchat organizers also routinely post session transcripts that in and of themselves are great learning resources for others involved in training-teaching learning. What was obviously common to both groups was the presence of strong, dedicated, highly-skilled facilitators who kept the conversations flowing, on topic, and open to the largest possible number of participants. There was also an obvious sense of respect and encouragement offered to newcomers as well as to those with long-term involvement—a willingness to listen as well as to contribute, and a commitment to extending the conversation to others not immediately involved. (Retweeting of comments was fairly common in both groups, indicating a commitment to sharing others’ comments rather than trying to dominate any part of the conversation solely through personal observations). What we continually see in both groups is an invitation to engage and a willingness to listen as well as contribute rather than the tendency to create and foster cliques that exists in less effective and less cohesive communities. A sense of humor and a fair amount of humility also appears to support the high levels of engagement visible in both groups—those who are most inclined to offer the occasional ironic/sarcastic/snarky comment just as quickly turn those comments back on themselves to draw a laugh and make a point that contributes to the overall advancement of discussion—and learning—that both communities foster. There also is more than a hint in both communities of creating learning objects through the transcripts and conversational excerpts (e.g., through the use of Storify) generated via these discussions. And that’s where some of the most significant results are produced, for embedded in those transcripts and excerpts are links to other learning resources that many of us may not have previously encountered. Following those links during or after the conversations continues our own personal learning process and, as was the case with #lrnchat yesterday, actually produce something with the potential to last far longer than any single discussion session. One of those unexpectedly productive moments of community-sharing-in-action yesterday came when, from my desk here in San Francisco, I posted a link to a Wikipedia article about third places—that wonderful concept of the places outside of home and work that serve as “the heart of community” and the third places in our lives, as defined and described by Ray Oldenburg in The Great Good Place: Cafés, Coffee Shops, Bookstores, Bars, Hair Salons and Other Hangouts at the Heart of a Community (1989). A colleague in Melbourne (Helen Blunden), seeing that link, quickly followed it to familiarize herself with the concept, then realized that “Third Place” would serve nicely as the name for a new learning and development community she is currently forming in Melbourne—which means that when members of #3placemelb (Third Place Melbourne) interact online, they’ll be the latest offshoot of a learning tree with roots in Oldenburg’s book first published in 1989; a well-developed trunk that has branches representing a variety of settings, including libraries; and continues to sprout twigs in online virtual communities such as #etmooc and #lrnchat, blended (onsite-online) settings, and that latest growth in Melbourne—all because great communities seem to beget additional great communities through collaboration rather than competition. N.B. : The #lrnchat sessions currently take place every Thursday from 8:30-9:30 pm EST/5:30-6:30 PST; #etmchat sessions are generally announced on Twitter via the #etmooc hashtag and are also promoted in the #etmooc Google+ community. A little exposure to openness can carry us a very, very long way, as I’m learning through my Open Education Week meanderings. Initially inspired to engage in Open Education Week ruminations and activities through my current immersion in #etmooc—an online Educational Technology & Media massive open online course (MOOC) developed by Alec Couros and colleagues—I am now finding myself nearly overwhelmed by how the current open movement module of the course is inspiring me to see rhizomatically-extending roots and shoots of “open” nearly everywhere I look. There is, for starters, the idea that the open movement itself encompasses an incredibly broad set of terms and actions: the “connect, collect, create, and share” elements of Open Education Week; the four tenets of the open movement as cited in an #etmooc panel discussion (reusing, revising, remixing, and redistributing content); and Don Tapscott’s quartet of collaboration, transparency, sharing, and empowerment from the TED (Technology, Entertainment, and Design) talk he delivered in 2012. But there is much more, as I’ve been reminded through additional reading and reflection over the past several days. A brief passage that I found in Enrico Moretti’s The New Geography of Jobs, for example, beautifully captures the idea that physically-open spaces within our worksites and coworking settings can facilitate a different—yet not completely unrelated sorts of—open exchanges of ideas and “knowledge spillover”—think Google, Pixar, the San Francisco Chronicle building Hub space mentioned by Moretti, and so many others that have recently caught our attention. (Not everyone is enamored of these physically-spaces, as the most cursory online search will show, and I certainly don’t believe that physically-open spaces should be universally adopted for all work we do; a little solitude can go a long way in providing us with the time we need to reflect and absorb what we learn.) The open work spaces, however, are far from revolutionary; they’re similar to what we have seen in our more innovative classrooms, for at least a couple of decades, where learners aren’t confined to desks but, instead, interact with each other and those facilitating their learning in collaborative ways. And it’s also the same concept we find in Ray Oldenburg’s The Great Good Place descriptions of how our interactions with friends and colleagues in our wonderful third places (coffee shops, neighborhood restaurants, and other settings which now extend to online communities where we can drop in unannounced and know our social needs will be met through stimulating interactions) produce the sort of creative results fostered by the open movement. It’s just a short intellectual jump from the open movement and Moretti’s thoughts to the greater world of open-movement exchanges of ideas, as we’ve seen in Frans Johansson’s The Medici Effect, that wonderful reminder that chance encounters under the right circumstances between people of varying backgrounds can produce far more than might otherwise be inspired. It’s as if we’ve tossed The Medici Effect into a huge mixing bowl with James Surowiecki’s The Wisdom of Crowds and Clay Shirky’s Here Comes Everybody: The Power of Organizing Without Organizations, let them brew a while, and then scooped out a wonderful ladle of open, collaborative thinking to see what new flavors we can discover. Which brings us back to Open Education Week and #etmooc itself: using the online resources available to us and the collaborative, participatory spirit that is at the heart of a successful MOOC and the open movement, we learn to viscerally understand, appreciate, and foster the spirit of open that drives these particular learning opportunities. And encourages us to openly engage within others in the hope that everybody wins during Open Education Week and for many more weeks, months, and years to come. N.B. 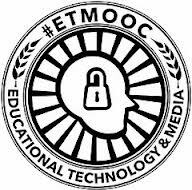 : This is the twentieth in a series of posts responding to the assignments and explorations fostered through #etmooc. Seeing someone wearing and using a Google Project Glass product at a neighborhood diner here in San Francisco was not among the experiences I expected to have over brunch this morning. Like so many other people, I’ve been fascinated by reports of the continuing development of this latest foray into the world of augmented reality. I have also been wondering when we would have a chance to play with what Google has been developing and start seeing how it will affect the world of training-teaching-learning. It’s been my long-standing assumption that my first face-to-face encounter with a Google Glass device would be at a tech or educational conference. But there I was, taking in the familiar faces of the Saturday morning crowd at Tyger’s (in San Francisco’s Glen Park Village), when my eyes froze at the sight of someone obviously wearing one of the devices that has been so prominently featured in so many articles over the past several months. The stunning thing about this sighting is that Tyger’s is far from a hotbed of technology. It actually feels as if it sprang full-blown from the pages of Ray Oldenberg’s The Great Good Place and continues to be a living example of a vibrant, dynamic Third Place—a place where you can walk in whenever it’s open, know that you’re going to find a familiar face, sit with friends over a nice relatively inexpensive meal, and participate in conversation rather than being surrounded by people more engaged with smartphones and tablets than with face-to-face exchanges. It’s the sort of place where candidates in local board of supervisors races drop in to talk one-on-one with residents of their district, and where strangers don’t stay strangers if they patronize the place more than a couple of times. Because Tyger’s is set up to foster conversation—the tables are set very close to one another, and it’s impossible not to overhear bits and pieces of nearby conversations—I didn’t feel the slightest reticence about immediately walking over to the table where the Google Glass user was sitting with his family. It also helps that a) I assume anyone wearing a new piece of technology is going to be far from shy about talking about it, and b) I’m hopelessly curious and socially inept enough to think that chatting up a total stranger is part of what fosters learning and nurtures new connections. Our brief conversation quickly confirmed that the device actually was a fully-functioning Google Glass device; that it is not yet available to the general public and probably won’t be available to most of us for “quite a while”; that he didn’t find it at all difficult to interact with those with whom he was dining while also taking advantage of what the device offers; and that he was in possession of the device because he (of course) works at Google. Returning to the people with whom I was sitting (“you really are a geek,” one friend lovingly admonished me), I took advantage of the fact that I was far enough away from him to not be an obvious nuisance, but was close enough to get a first-hand look at how someone wearing a Google Glass product would function in what is overwhelming an onsite Third Place rather than an extension of a virtual community. What I noticed was impressive. He was sitting with his wife and one other adult, and was holding an infant in his lap. There was no visible sign that he was anything other than completely engaged with his child and the other people present at that table throughout the entire meal. And the way the device was positioned on his head (a small silver band with the tiniest of cameras positioned near his left eye without appearing to obscure his vision) made it relatively unobtrusive. In fact, he seemed far more present than most people who use smartphones and tablets appear to be—which, for me, raises some interesting questions about all I’ve read over the past few years regarding our overrated ability to multitask. Yet when I watched that Google staffer behaving no differently than anyone else at Tyger’s was behaving, and noticed that no one else at Tyger’s was even reacting to the presence of someone with a new tech device that is not yet available for purchase by most members of the general public, I found my attitude shifting just a bit. I no longer feel as if “resistance is futile” is a completely negative reaction to the sight of someone wearing a Google Glass product; I’m now a step closer to understanding the appeal of the wearable technology that colleagues and I have been exploring through work on the 2013 New Medium Consortium Horizon Project Higher Education Report. And I’m even more curious about what it will be like to try on a Google Glass device myself to see what it will bring to the entire field of training-teaching-learning. N.B. 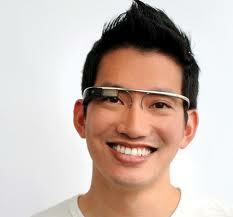 : The photo accompanying this article is a generic Google Glass image. 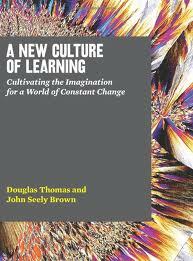 If doing is learning, there’s plenty to learn and do with the ideas Douglas Thomas and John Seely Brown present in A New Culture of Learning: Cultivating the Imagination for a World of Constant Change. Working with the theme of social/collaborative learning that we’ve also encountered in The New Social Learning by Tony Bingham and Marcia Conner, in the New Media Consortium (NMC) Horizon Report 2012 Higher Education Edition and “Communiqué from the Horizon Project Retreat” held in January 2012, the eLearning Guild’s new “Social Learning: Answers to Eight Crucial Questions” report, and many other books, reports, and documents, Thomas and Brown take us through a stimulating and brief—but never cursory—exploration of “the kind of learning that will define the twenty-first century.” And it won’t, they tell us right up front, be “taking place in a classroom—at least not in today’s classroom. Rather, it is happening all around us, everywhere, and it is powerful” (p. 17). As we’ve already seen in a series of articles here in Building Creative Bridges, our learning spaces and the way we foster learning are continuing to evolve—which doesn’t necessarily mean, as Thomas and Brown note in their own work, that we’re completely abandoning classrooms and the best of the training-teaching-learning techniques we’ve developed over a long period of time. But the fact that plenty of effective learning that produces positive results “takes place without books, without teachers, and without classrooms, and it requires environments that are bounded yet provide complete freedom of action within those boundaries” (p. 18) offers us plenty of possibilities to rethink what we and the people and organizations we serve are doing. Their summary of how Thomas’ “Massively Multiplayer Online Games” course at the University of Southern California seemed to be spinning wildly out of control as students more or less restructured the class from lots of lecture and a bit of demo to lots of exploration followed by short summary lectures at the end of each session leads us to the obvious and wonderful conclusion that, by taking over the class, the learners were also taking over control of their own learning and producing magnificent results—a story similar to a situation also documented by Cathy Davidson in Now You See It. And it doesn’t stop there. As they lead us through a brief summary of instructor-centric and learner-centric endeavors, we see a theme that crops up in much of what is being written now about m-learning (mobile learning, i.e., learning through the use of mobile devices): that the new culture of learning “will augment—rather than replace—traditional educational venues” and techniques (p. 35). What flows through much of Thomas and Brown’s work—and what we observe in our own training-teaching-learning environments—is what they address explicitly near the end of their book after having discussed the importance of learning environments: the need to foster playfulness in learning and the parallel need to work toward a framework of learning that builds upon the Maker movement and that acknowledges three essential facets for survival in contemporary times: “They are homo sapiens, homo faber, and homo ludens—or humans who know, humans who make (things), and humans who play” (p. 90). We have plenty of examples upon which to draw: Michael Wesch’s experiments with his Digital Ethnography project at Kansas State University; the YOUMedia Center for teens at the Chicago Public Library; smart classrooms where technology enables creatively productive interactions between onsite and online learners; and even the information commons model that began in academic libraries and is increasingly being adapted for use in public libraries. There’s much to explore here, and that’s why some of us have been promoting the idea that it’s time to add to Ray Oldenburg’s The Great Good Place concept of three key places in our lives (the first place being home, the second place being work, and the third place being community gathering places where we find and interact with our friends and colleagues away from home and work) with a new Fourth Place: the social learning center that onsite as well as online as needed. Another theme that Thomas and Brown bring to our attention is the way communities—those vibrant foundations of our society that are so wonderfully explored by John McKnight and Peter Block in their book The Abundant Community and continue to be fostered on The Abundant Community website—are developing into collectives—less-than-rigid gatherings of learners and others who are drawn by immediate needs and then disperse if/when those needs are met. “A collective is very different from an ordinary community,” Thomas and Brown write. “Where communities can be passive (though not all of them are by any means), collectives cannot. In communities, people learn in order to belong. In a collective, people belong in order to learn. Communities derive their strength from creating a sense of belonging, while collectives derive theirs from participation.” (p. 52). All of which leads us to an obvious conclusion: if we are inspired to do the things within our communities, collectives, and organizations that Thomas and Brown describe and advocate, we will be engaged in building the new culture of learning they describe—while learning how to build it. Many of us, having incorporated online communities into our professional and personal lives, reach the moment when we decide that the idea of place is dead—that geography no longer matters. But it doesn’t take us long to realize we’re wrong. 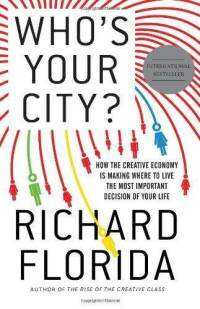 And reading and thinking about Richard Florida’s Who’s Your City? : How the Creative Economy Is Making Where to Live the Most Important Decision in Your Life (2008) drives the point—and us—home. Florida, continuing to focus on the role creativity plays in making communities vital, vibrant social and economic centers, writes clearly and engagingly as he points out how “spiky” the world remains in terms of having peaks of social and economic centers that offer opportunities not to be as readily found in the valleys that exist elsewhere. “Today’s key economic factors—talent, innovation, and creativity—are not distributed evenly across the global economy,” he reminds us (p. 9). “They concentrate in specific locations” including centers of innovation such as Tokyo, Seoul, New York, and San Francisco (p. 25). 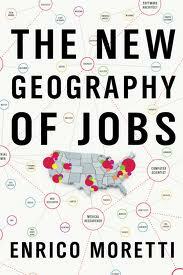 There are also mega-regions that continue to thrive, including Boston-NewYork-Washington-Baltimore, Osaka-Nagoya, Frankfurt-Stuttgart, and several others he cites throughout his book. “More and more people are clustering in urban areas,” he writes (p. 18), and that clustering encourages people “to do more than they otherwise would, such as engage in more creative activities, invent new things, or start new companies—all things that are both personally fulfilling and economically productive…This creates a regenerative cycle: the stimulation unleashes creative energy, which in turn attracts more high-energy people from other places, which results in higher rates of innovation, greater economic prosperity, higher living standards, and more stimulation” (p. 159). This won’t be news to those familiar with Jane Jacob’s The Death and Life of Great American Cities (1961), Christopher Alexander’s A Pattern Language: Towns – Buildings – Construction (1977), The Timeless Way of Building (1979), and just about everything he has written, William Whyte’s City: Rediscovering the Center (1988), Ray Oldenburg’s The Great Good Place (1989), Frans Johansson’s The Medici Effect, or writing colleagues and I have done on the proposed Fourth Place in our lives—the social learning centers that serve as our onsite-online sources of learning opportunities in a world where continual learning is one of the keys to success. But it does remind us that the geography of place is far from dead—even if it now so clearly co-exists with place as an online construct through the sort of communities and associations I wrote about two days ago to describe my own onsite-online sense of community and professional family through the American Society for Training & Development (ASTD). As is the case with so many blanket statements we make and eventually have to recant, the role of place in our lives is evolving to accommodate that sense of place that includes onsite as well as online places. Rather than creating either-or distinctions here, we’ll find ourselves on terra firma and in terra virtual if we see place in a blended seamless way. The place we call home. The places we temporarily join when we travel to work. The third and fourth places in our lives—those coffee shops, restaurants, community centers, and social learning centers which so clearly contribute to our onsite-online place in the world. And the online places that facilitate the connections that matter most to us in terms of making us members of a variety of interconnected world-wide communities of learning, interest, and practice. With a renewed appreciation for all that home offers in this still evolving onsite-online world.